David Cameron's A-List of Tory election candidates has come under attack for putting celebrities and "beautiful people" ahead of local campaigners. David Burrowes, from the right-wing Cornerstone Group of Conservative MPs, said local champions proved more popular with voters. Tories in winnable seats are being urged to choose candidates from a list of 100 elite candidates. 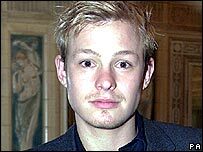 The list includes former soap star Adam Rickitt and author Louise Bagshawe. Mr Burrowes told BBC Radio 4's Today programme the party should not try too hard to choose candidates in London and "parachute" them into constituencies. He said: "What we need is much more effort on local determination, a wider choice of people, whether it be from the voluntary sector, people championing social justice issues, and issues we're all concerned about. "But it has to be much more of that local dimension, with all that experience that comes from being a local champion for people. "That's what people want. They don't so much want a celebrity or someone who's a beautiful person - they want someone who is going to be working hard locally, for the benefit of all." Mr Burrowes, who secured the biggest swing to the Tories when he won Enfield at last year's election, has examined 70 seats. He found that the biggest factors in winning over votes were choosing candidates early, selecting local people, fighting professional, well-run campaigns, and targeting areas outside Tory "heartlands". Cornerstone Group chairman John Hayes said putting candidates with little local knowledge into key seats was "the bizarre theory of people who spend too much time with the pseuds and posers of London's chichi set and not enough time in normal Britain". But former Conservative MP and television personality Gyles Brandreth said being a minor celebrity had helped him win press attention and "stand out from the crowd" when he was first elected. He argued: "There is a kind of obsession, though, among the local activists about being local. "And they maybe forget that the job of a Member of Parliament is not to actually be in your constituency but to represent your constituency in Parliament. "You are a Member of Parliament, it is a national job." The first test of the A-list, which is part of Mr Cameron's efforts to make the candidates more representative, will come at the by-election caused by the death of MP Eric Forth. But party officials have indicated that Bromley and Chislehurst Tories will be able to choose a local candidate. And Tory chairman Francis Maude has assured local associations that the leadership is not trying to foist "mincing metrosexuals" on to "gritty northern" seats.